Argentina's President Nestor Kirchner has pledged to continue strengthening ties with Venezuela. He said he would not bow to pressure from the US and others who wanted to isolate Venezuelan leader Hugo Chavez. The two men signed oil and trade agreements and announced the issuing of a joint bond worth $1.5bn (£770m). Mr Chavez said President George W Bush would fail in what he called his attempt to divide Latin America during his forthcoming visit to the region. Mr Bush is due to visit a number of Latin American countries next month, including Brazil, Colombia, Guatemala, Mexico and Uruguay. During his visit to Venezuela, Mr Kirchner said his country along with Venezuela and Brazil had to build a space in South America that guaranteed dignity and justice. 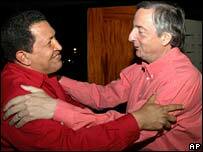 Argentina would gladly join a Bank of the South proposed by Mr Chavez to finance regional projects, he said. "It cannot be that it bothers anyone that our nations become integrated," Mr Kirchner said. "Much has been said recently that... in [Brazilian] President Lula's case or in my case that we had to contain President Chavez - an absolute error." The US Undersecretary of State Nicholas Burns has said his country can work with the left-leaning governments of Argentina and Brazil, but Venezuela is "another matter". Venezuela is a major supplier of oil to the US, but the ties between the two countries have been strained for several years.